What better way to start your morning than with seven feet of snow? That’s what the lucky people of New England are saying (or not saying) as they endure the wrath of the aptly named Thundersnow. This type of storm occurs when a thunderstorm features snow instead of rain, and is just the latest storm in a record-breaking month of winter weather. The phenomena led to 20,000+ searches, which might have at least a little to do with The Weather Channel’s Jim Cantore’s on-air celebration when the storm hit. Whatever makes you happy, Jim. All eyes will be on the Academy Awards this Sunday, and people are prepping for their Oscar parties turning to the Internet to find out who’s up for Best Actor and Best Actress. But the highlight of the event is the Best Picture Category, which many consider to be a tight race this year. 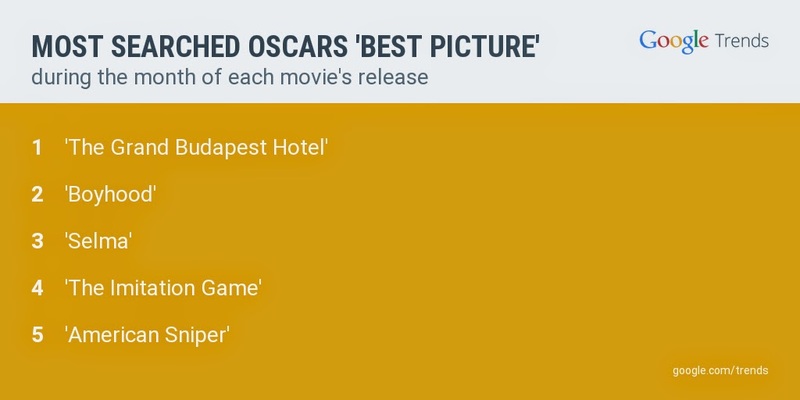 The favorites are Boyhood and Birdman, but if searches this past month determined the winner, it would be Wes Anderson's The Grand Budapest Hotel. And if we’re talking about a night out with the stars, does anyone know where Cindy Crawford is? This past week, unretouched photos of the American supermodel appeared online and, well—she still looked stunning. The photo went viral and drummed up a discussion on the media’s portrayal of female beauty. The party didn’t stop at midnight this past Tuesday as people started their Mardi Gras/Fat Tuesday celebrations. Searches for the holiday spiked on February 17, and there was an increase in searches for New Orleans delicacies beignets and King Cake. On the other side of the world, many people in Asia welcomed the Year of the Goat (or sheep...or ram...whichever you prefer) as they rang in the Lunar New Year with style, not to mention topping the charts with more than 2 million searches. Lady Gaga electrified search this week when she announced that she’s switching her Poker Face for a wedding veil to marry boyfriend Taylor Kinney. Fans of the pop queen took to the web to find photos of her heart-shaped engagement ring and new fiancé, causing searches for Kinney to hit an all-time high. Doesn’t sound like a bad romance to us. Speaking of electricity, this past Wednesday our doodle marked the 270th birthday of the godfather of all Energizer Bunnies, Alessandro Volta, the inventor of the first electrical battery. Searches for “Who is Alessandro Volta” and the “voltaic pile” hit highs, ensuring that the great inventor will be remembered for years to come. Don’t have time to watch the three-hour-long Academy Awards this weekend? Just search for the Oscars in the Google App and you’ll find the latest info on what just happened, from acceptance speeches to behind-the-scenes moments. What we learned this week on search: New England’s stuck in a winter wonderland, Cindy Crawford doesn’t need makeup to look better than the rest of us and Lady Gaga’s caught in a good romance. Read on to learn the details.